According to a Mortgage Bankers Assn.’s delinquency report, home loans in foreclosure or at least one payment past due have gone down to the lowest level since 2008. The quarterly study, released May 16, said 7.4% of all loans on 1-unit to 4-unit properties were past due at the end of the quarter, seasonal factors considered, down from 7.58% at the end of the fourth quarter and 8.32% a year earlier. The actual number of homes being repossessed remained high, as lenders continued to work through huge backlogs of distressed properties. Homes in foreclosure represented 4.39% of all homes, up from 4.38% in the fourth quarter but down from 4.52% a year earlier. Combining delinquent loans and mortgages in foreclosure proceedings, one of every nine U.S. mortgages was showing at least initial signs of distress. Still, that was down by about a percentage point from a year ago and from the final quarter last year. As in other recent reports, a higher percentage of homes are in foreclosures in states where foreclosures are handled within the court system than in states in which homes are usually repossessed and sold outside the courts. In California, a non-judicial foreclosure state, 3.3% of homes were in foreclosure — more than a percentage point below the national average. Arizona, another state with foreclosures outside the courts, had 3.6% of its homes in foreclosure proceedings. In contrast, Florida, a judicial state, has 14.3% of homes in foreclosure and New Jersey has 8.4% of homes in foreclosure. Fratantoni believes these states will have a lingering problem for years. New foreclosure actions were started on 0.96% of all homes during the first quarter, down from 0.99% last quarter and 1.08% one year ago. 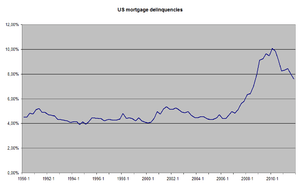 The most problematic loans continue to be those made at the peak of the housing bubble. The Mortgage Bankers Assn.’s category of seriously delinquent loans — those in foreclosure or more than 90 days in arrears — remains three times the long-term average, Fratantoni said, and 60% of these badly distressed loans were made from 2005 through 2007. A recent report from San Diego researcher DataQuick showed that the number of homes entering foreclosure in California was down 17.6% year over year, at the lowest level since mid-2007. Santa Ana researcher CoreLogic said greater use of loan modifications, short sales and deeds-in-lieu by lenders had contributed to the foreclosure downturn. Read the original Los Angeles Times article by E. Scott Reckard here. Former Realtor at Coldwell Banker George Realty in Alhambra, California. Graduate Realtor Institute (GRI), Accredited Distress Property Specialist (ADPS), Short Sale & Foreclosure Resource (SFR). This entry was posted in Uncategorized and tagged Mortgage Bankers Assn.. Bookmark the permalink. Where Is Our Housing Market At Right Now?